Explore the world underneath the surface of the Aegean with this guided scuba dive. Learn about how to properly dive and to be able to properly identify sea life. 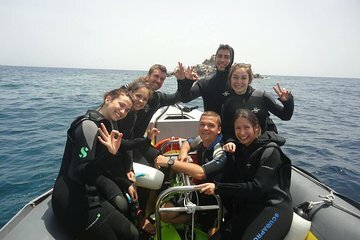 We had a great time on our dive. Unfortunately we arrived late as we had difficulty getting a taxi from the port where our cruise ship was docked, but the dive shop was very accomodating and we did a beach dive. The staff was wonderful. Well worth the experience for any level of diver who wants to do something different on a cruise - I did the early morning one tank shore dive with two young ladies from the shop -- the dive guide and her student assistant. Though not spectacular in terms of fish life, water was clean, great visibility, dive guide led me leisurely around for about an hour without any worries -- anyone -- long-term diver like myself or novice who just would like to relax and say they went diving off a Greek island as any true diver would want to be and who wants to get purchase their dive cap or shirt for their collection as any true diver would want to do should do this if on a cruise -- there is more than enough time for the dive, lunch and a visit to the town before returning to your ship.